While smartphones are getting bigger and better every day, very few of them are both ‘the Big & the Better’. In my hunt for a big smartphone or we can call it a Phablet, that is worth having, I came across this amazing device from Asus Zenfone Series – The Zenfone 6 ( A600CG/A601CG). So let’s dive deep into the features and specifications of this device and more importantly its camera quality, browsing, gaming & general performance with my following review. If you are a lazy reader or just too busy right now, you can also skip to the hands-on video review in this article. I had a white review unit that I’ve used for about two weeks, but Zenfone 6 is available in four colors – Gold, Deep Black and Pure White & Dandy Red. The very first thing you notice about Asus Zenfone 6, is the impressive customization made by Asus, which is known as as ZenUI. They have added some of the coolest features in the ZenUI, considering the big size of Zenfone 6. I will cover more details about Zen UI later in this review, but lets go through some of its physical features first. This device comes with metallic front facing plates on top and bottom, that adds premium feeling, when you hold the device. On the top-side of Zenfone 6, you get a standard 3.5mm Audio jack, that goes with the White colored back-cover. On the bottom-side, you have microUSB slot for charging and data connection. On the right side of this device, there are volume rockers with good-looking metallic finish and a power button. All of these buttons give a great feedback for clicks and are sturdy to use. The left side of Asus Zenfone 6 is empty, that maintains the premium pure white look of the device. On the back, Asus Zenfone 6 has this 13 MP camera with LED flash and the Asus branding. So overall, the device has an impressive premium look, compared to monotonous looks of Samsung Galaxy Grand 2. The big display looks sharp and its size is an important asset to managing Zen UI elements. So overall, the device has an impressive premium look, compared to monotonous looks of Samsung Galaxy Grand 2. The big display looks sharp and its size is an important asset to managing Zen UI elements. All three buttons are capacitive and located above the shiny metallic plate. So there are two separations below the actual display, which is a unique signature most of the Zenfone devices share! 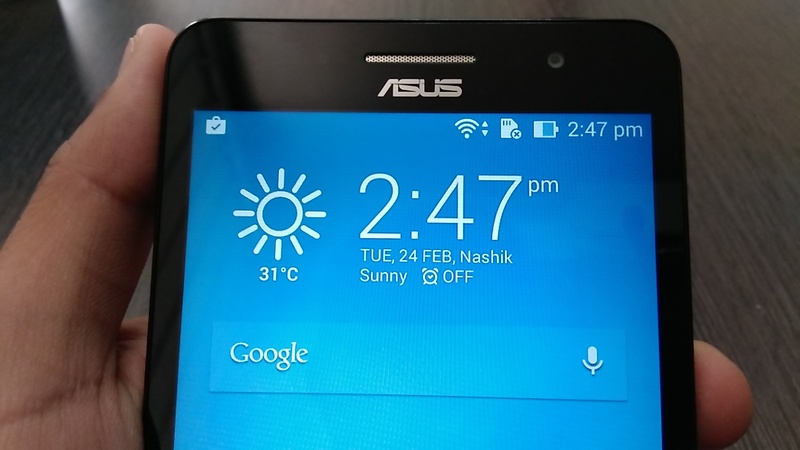 On the top we have metallic Asus logo, well merged with the bezel. The device’s earpiece is located at the center and has big coverage overall accompanied with the front facing 2MP of camera. The pure white back cover enhances all the premium elements of the device. But that also makes it hard to keep it away from smudges, even though they are not really hard to clean up. On the bottom, you have the large speaker unit, that produces decent sound for music and movies. The speaker sound is preferable compared to packaged headphones, which are not very good. Above the speaker unit, we have this light-colored Zenfone & Intel processor’s branding. The 13MP camera comes with a wide f/2.0 aperture that allows more light, to capture finer details in every photo. The unique Zenfone camera software helps you boost photo quality by adjusting the pixel sizes. This helps us produce bright and sharper images with high-resolution. The bright LED flash will help you capture the moments even in low light. The best thing I experienced with Zenfone 6 is its enormous display. The capacitive touch-screen of this phablet responds super fast and combined with the ZenUI’s smoother animation, it’s a delight to use this device. With 16M colors, the image reproduction is lifelike. And being an IPS display offers great visibility from any viewing angle. I loved the customization done with ZenUI, which looks way much better than Android’s native user interface. I personally find most of the customizations annoying like from the LG, Micromax or Samsung’s Touchwiz, But then there are these good ones which improve the functionality like the ZenUI or HTC’s Sense UI. Swipe from left corner, you get the notifications listed. And swipe from the right to get this quick access bar, which has these custom tools available in notifications bar. Smart savings, reading mode and Boost memory are some of my favorites, but let me show you this boost feature, that will clean up temporary memory and make your device faster in single-click. Swipe from left corner, you get the notifications listed. And swipe from the right to get this quick access bar, which has the custom tools available in notifications bar. Smart savings, reading mode and Boost memory are some of my favorites. Boost feature will clean up temporary memory and make your device faster in single-click. Something we always need and we have to use the third-party app for the same. Another great feature of this ZenUI is the one hand operation mode, which collects all your screen to one side of the display. You can easily work on the screen using your thumb, and for a big device like this, it kind of become necessary for daily usage. Starting from the top notification bar to the home screen buttons, you can operate this device in its full glory but in smaller size. You can use 4.3 inch, 4.5 inch, and 4.7 inch, based on your personal preferences, and get back to the normal view with a one-click button. For experiencing the browser performance, let’s try to digitalconqurer.com in the default chrome browser available on Zenfone 6. The page loaded pretty quick office WiFi network, and the page is response is swift. Browser performance is one of the prime indicators of whatever the device manufacturer’s promises you on paper. And so far, I’ve loved the way Asus Zenfone 6 have performed. The touch response on the browser is very quick, and kinetic scrolling works perfectly. And and you can see in following Zenfone 6 video review that, I can easily interact with the responsive web interface of my blog. The pinch-to-zoom is feature on Asus Zenfone 6 is pretty perfect, and the text renders out sharp, even with the full zoomed-in view. I tried playing a random video, which looks great on this big screen. It buffered quickly and playing without any stuttering or glitches. Overall, it’s a good device to watch videos or movies on thanks to its big speakers on the back side. I also tried playing some cool games like Tank Recon 3D and Gun Bros 2, and like the movies, they performed pretty well. The device did not heat or anything even for longer gaming sessions and frame rates were quite impressive. The camera app looks a lot different from the standard android app and has a lot more to offer. Starting from controls like exposure, ISO values & Self-timer to Stabilizing enhancements. So, Zenfone 6 is a perfect companion for the photography enthusiasts. The Zenfone 6’s rear camera comes with the auto-focus and manual focus, both of which works great under standard lighting conditions. The video settings have options like quality selection, video stabilization, and preferences settings. The UI of the camera is quite placed, and you can quickly select turbo modes, effects controls, switch between video, front camera, and photos. Recording videos are better in the well-lit conditions compared to low light. But you can switch your focus on different objects while recording it, which is a big advantage. So that’s all from the performance point of view, and like I said, it’s a great phablet to own, even in 2015. Before I conclude my review, let me quickly show you the available ports on the back of this device, and the quality of its built. Under the back cover, there is this unique placement for the two SIM Cards, and the microSD memory card, on top of it. Above that is a 13MP camera with the bright LED flash, that helps you with the low light conditions. The back cover of this device is in pure white color, and it will be different if you chose some other available colors. Being a white colored plastic back-cover, it captures a bit of smudges every now and then. But they are easy to clean up. Unlike the rest of the metallic and glass body, the back-cover is pretty light weight. It feels durable and should last longer. Unlike the rest of the metallic and glass body, the back-cover is pretty light weight. It feels durable and should last longer. So overall, the Asus Zenfone 6 is solidly built device, that would be easy to carry around and will survive through some rough usage. Powered by Intel Atom 1.6Ghz Quad Core Processor, mighty 6 inches of IPS display, with 1280x720p resolution, a decent 13 MP read and 2 MP front camera, and additional features like Bluetooth 4.0, Wi Fi Direct and Dual-SIM, makes it one of the most feature rich device you can buy under a price tag of Rs. 16000. I will highly recommend device for those who loves big devices especially for watching movies, browsing or reading books. I will highly recommend phablet being one of the best 6-incher to own, for those who loves big displays especially for watching movies, browsing or reading books.